It is a process that has come to be known by many different names. 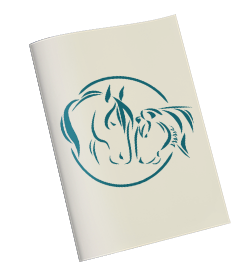 Equine-assisted psychotherapy, equine-assisted mental health, equine-facilitated experiential learning, equine-guided education, equine-assisted learning, equine-assisted counselling, equine-facilitated wellness, equine-assisted coaching, and so on… each one representing a different philosophical approach, different practices, different training requirements and standards, and different perspectives. What unites them all is a foundational belief in the ability for horses and humans to learn and grow from one another in beneficial ways. Horses are prey animals that live in the present moment, without shame or embarrassment for their needs, acting on natural impulses and drives. Like us, they are comprised of a nervous system, a unique personality, emotional and biological needs, including a need for social contact (herd mammals), and a life history. They are honest, transparent and sensitive creatures that are highly aware of their surroundings and have developed the ability to read and respond to situations and social dynamics by paying attention in a particular way to their senses and surroundings. Unlike us, they do not live in their heads and instead live in tune with their bodies and body sensations without panicking about them, bracing against them, or trying to fight them. They have the ability to allow what wants to happen in their bodies with grace and ease. Similar to humans, equines can experience fight, flight, freeze and other survival energies, trauma, “management strategies” (like addictions and other behaviours that serve as defensive accommodations or coping strategies) and, when free to do so in a natural environment, also have the ability to release whatever is in their bodies to return to a state of balance and aliveness. Bottom up processing: Trauma is a bodily held experience, which makes trying to talk our way out of trauma and into safety and connection an impossible task. Equines do not have as developed a neocortex as humans do, which means that relating to horses involves the parts of the brain directly involved in trauma and recovery (including the limbic system and reptilian brain), as well as the rest of the body, implicit memory, movements, impulses, and emotions. EQUUSOMA™ Equine-Facilitated Trauma Therapy is both somatic and experiential as opposed to a strictly cognitive experience. Although all equine-based interventions are deemed experiential, not all incorporate somatics or an understanding of the nuances of trauma and attachment psychophysiology. Bottom up processing is not about creating change by overriding through force of will (top down), but about shifts that occur in one’s inner bodily experience that filter up. Somatic awareness and embodiment: Interoception refers to our ability to pay attention to internal and external information, with a curious inner adult witness. Learning to notice somatic cues and behaviours in horses and in oneself is an important part of here-and-now awareness, presence in relationship with self and others, recognizing and exploring attraction and aversion impulses, and tracking signs of activation and settling in the nervous system. This in turn supports a more cohesive, integrated and regulated sense of self. 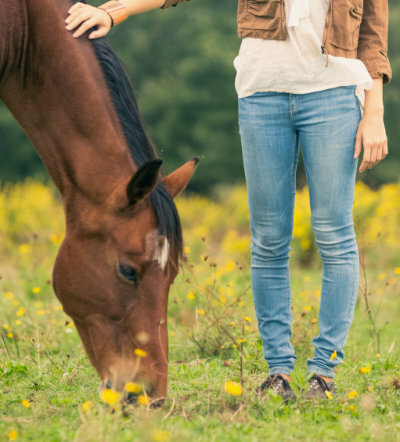 Attachment and relational / boundary repair: Building relationships with horses can set the foundation for fostering healthy attachments and boundaries with humans that are grounded in mutual respect, consent, choice, voice and empowerment. Relationships with animals can be an important transitional step to developing relationships with humans. Witnessing the attunement of human co-facilitators to not only the clients’ needs but also the needs of equine partners helps provide a corrective emotional experience of trust and safety. Interacting with horses supports ventral vagal engagement, which helps to settle the nervous system and increases capacity for connection and intimacy. The companionship of animals can also offer an experience of belonging and opportunities for learning social cues and communication skills, which can be lacking in the case of early developmental trauma. Experiencing supportive touch: Touch work for supporting regulation, containment and attachment/boundary renegotiation is an integral part of the Somatic Experiencing® trauma resolution method. For clients who are not yet ready to explore touch-related interventions, exploring boundaries and safe touch in relationship with a horse can provide a helpful and titrated first step into the felt sense of being supported, grounded and contained. This in turn can help provide the conditions or platform from which to allow more challenging emotions or internal experiences to emerge and be experienced and released/integrated within one’s organism, thanks to the supportive outer container offered by the horses and human co-facilitators. Co-regulation and coherence: Co-regulation refers to the process mammals experience in attachment relationships, where our nervous systems resonate with one another like tuning forks, promoting shared experiences of settling, bonding and attunement (similar concepts include entrainment, resonance, and social contagion). Co-regulation in early development is especially important to support young nervous systems to feel soothed when distressed and develop a healthy window of tolerance, and is a crucial component of neurosequential development. Experiencing the felt sense of safety in relationship with horses and with other humans can set the conditions for co-regulation to occur. Combining specific Somatic Experiencing® skills during interactive activities with equines can further support the development of self-regulation and the fostering of overall coherence and organization within oneself. Neuroception: Horses recognize that safety can shift from one moment to the next. However, even horses can experience faulty neuroception like humans, where one’s sense of threat is either stuck on “on” or “off”, either hypervigilant or tuned out, without much of a flexible mid-range in between. Spending time with horses and observing the signalling systems within a herd can help to recalibrate a felt sense of safety/threat through exploratory and defensive orienting, and begin to experience a greater range of flexible responses, including grounded awareness in the present moment. Time orientation: Flashbacks, survival energies (“trauma vortex activation”) and fragmented ego states can lead to a sense of derealization, or disconnection with current reality. The rich sensory environment of a farm provides ample opportunities to build dual awareness of oneself and one’s inner experiences in the present moment, to help feel more connected to a sense of self that is properly situated in time. Biofeedback: Mammals “ping” off one another. We ideally turn to our social groupings or herds for confirmation of safety or threat, and we respond to one another’s states because at one point it was a biological imperative that we do so for survival. Horses have retained this ability to “ping” off one another, and model what it is to live in responsive attunement with each other. Relationships and interactions with equines and human co-facilitators provide the opportunity for immediate and honest biofeedback in the moment from other mammalian nervous systems, both in terms of our own regulation and arousal (emotional/phyisiological state of activation or settling), but also in terms of helping determine safety or threat, attraction and aversion, and whether something is too much, not enough, or just right. Affect tolerance: Interactions with equines can support the development of both positive and negative affect tolerance, including the ability to tolerate incrementally larger moments of calm, joy, play, aliveness and a sense of achievement and self-worth, as well as sadness, fear, anxiety, anger, shame, and grief. Somatic Experiencing® and other somatic/attachment-related techniques in combination with equine-facilitated trauma therapy can support clients to work through survival responses/energies in a way that is less likely to overwhelm the nervous system. Resourcing and object permanence: Spending time outdoors with animals offers a good opportunity to work on internalizing an embodied felt sense of external resources, in order to develop the ability to recall and feel soothed by others or experiences after the fact. Mobilization of defensive responses: For certain individuals, trauma healing and recovery may involve the completion of certain thwarted self-protective responses. Being able to begin at lower thresholds and increasing incrementally to larger thresholds of movements in a context not directly related to the original trauma can help with building capacity and confidence for agency and assertiveness in a new way that may not have been possible before. The restorative potential of combining somatic psychology and the relational dynamic of equine-assisted learning to foster resilience and greater well-being for people is very inspiring to me. I feel we each have an innate capacity for healing and wholeness. Horses are majestic beings that can ground us in the depths of our essence and teach us how to find our way back to what is authentic and true within our own lives and in community with others. I feel honored to team up with humans, horses and nature to facilitate the experience of authenticity, mutual respect and healing. “It’s our nature to get along.” I value embodied presence and fluid access to the vast array of sensing, feeling, moving, relating, and thinking states. Somatic Experiencing and horses are (each and both together) helpful for developing and enhancing the sense of self, and our ability to ask and find answers to “Who am I right now, and what do I need?” Learning with horses helps us intimately experience our own internal and relational states as we move from stuckness into living a life more flowing with presence, confidence, spontaneity, and pleasure. It’s not always an easy journey but it’s doable. My experiences with horses have been a key piece of integrating my own Somatic Experiencing work and learning. Their sensitivity to energy and the elements of our human experience that we often tune out makes them wonderful teachers. One of my favourite things to do is spending time in a field with a herd of horses and experiencing the magical interactions that unfold.